Slow Food Grand-Duché is a Slow Food Convivium. (Slow as opposed to fast food and fast life. Convivium: Latin for convivial gathering). Our members care about Good, Clean and Fair Food. 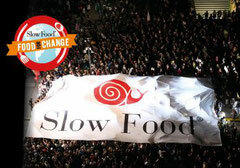 Slow Food Grand-Duché is a non-profit "green" organization active in Luxembourg since 2013. We are part of the Slow Food International Movement created in 1989 to counteract the growing negative effects of fast food and fast life. Slow Food Grand-Duché is entirely organised and run by volunteers. A steering Committee of 10 members meets periodically to coordinate the Convivium's activities. fair food for those who produce it and for consumers who buy it. Through our food choices we can collectively influence how food is cultivated, produced and distributed, and as a result bring about great change. We believe it is very important to hinder the decline of local food traditions. Consequently we all should be active food consumers weaving links with local producers and artisans in the food industry who share the same Slow Food philosophy. Pleasure of food is a universal right but we also have a duty to preserve our food heritages, traditions and cultures that make the pleasure of food possible. We are responsible for what we eat and we set examples to be followed by the younger generation. We are convinced that conviviality and need for companionship among humans are the binding elements of our diet. WHY IS BIODIVERSITY SO CAPITAL ? 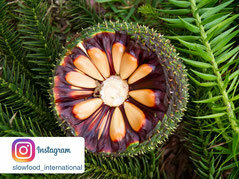 Preserving the variety of plant and animal life in a particular habitat is vital. Biodiversity refers to a simple concept, relevant to everyone, because it is nature, it is life itself and it is the diversity of life, on many levels, from the smallest (genes) to plant and animal species, up to the most complex levels (ecosystems). All these levels intersect, influence each other and evolve. Each species, no matter how small, all have an important role to play. Following recent studies, earth is undergoing its sixth mass extinction at a very quick pace (during the fifth mass extinction, 65 million years ago, the dinosaurs disappeared). This time, however, the cause is different because, for the first time, humankind is responsible. Humans continue to destroy rainforests, cement over the land, pollute the water and the soil with chemical pesticides and fertilisers. 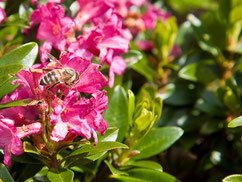 Bees and other pollinators are in danger. Together with wild flora and fauna, many plants, domesticated by man, and animal breeds selected for their milk or meat will also disappear. Only small-scale farmers and fishers understand and respect the fragile equilibrium of nature but their work conditions are not always easy. Below you will find two examples of what Slow Food Grand-Duché does. If you want to have a look at our past activities and events, please click on Activities&Events. For more information, if you have questions on our activities and events, feel free to contact us! 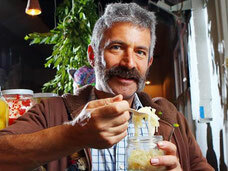 Food and taste education are among Slow Food Grand-Duche's priorities. On a regular basis we organise food-taste workshops involving young preschool and school pupils. 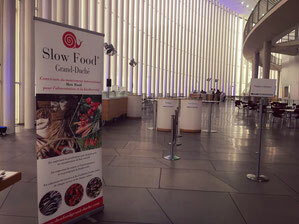 Since 2015 Slow Food Grand-Duché has started a monthly cooperation with the Philharmonie de Luxembourg hosting "Lunch Concerts". During 30 minutes, participants have the opportunity to watch and listen to a free public rehearsal performed by the Orchestre Philharmonique du Luxembourg, or a concert performed by guest musicians followed by a lunch (not free, registration is needed). 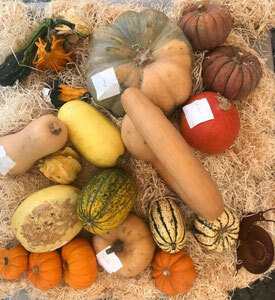 Our task, in this project, consists, among others, in raising awareness on the importance of biodiversity and seasonal products. Products used to prepare the meals come, as far as it is possible, from producers based in the great region.